There is good info in the tips&tutorials subforum, but I find that I do not use it ofter enough just because subject matter is hard to find. 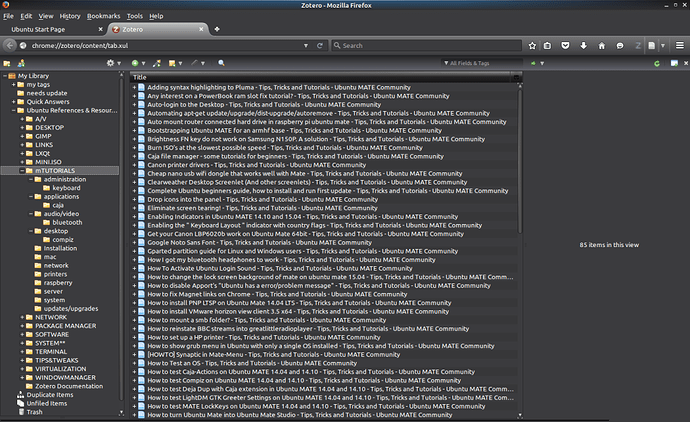 I run a collection manager (zotero) and decided to index this subforum for ease of use. Now I wonder if this would be useful (maybe as a sticky) in your forum. I could convert this over for forum use if you like the idea. Additional sub-categories for some categories? I really like the look of zotero, So I installed form the software centre. But, I can’t see it anywhere. Any idea what I might have done wrong? Which install did you use? I have it installed direct into firefox from the zotero site. No need to use any package manager for this. I’m not familiar with the standalone install, but would suggest you take a look in /usr/share/applications/ for a launcher if this is what you did. A launched can be dragged to the panel from there. In addition I believe an index of the available tutorials would be useful! Yes further organisation is necessary, sub-categories are necessary. What I posted is 1st draft. It would be nice if anyone could edit a sticky. Or maybe giving a few people permission to edit. Speaking just about TT&T, it could be maintain by one person, but better to have others. Your link is impressive. You have certainly thought about this much more than I. A lot has changed since this thread. New categories, topics sub-categorised and we now have tags! We could make a sticky thread, but I’m thinking we could semi-automate this by making use of tags so topics can be searched by subject but specifically inside the Tutorials & Guides category. Only downside is that I haven’t found the syntax to search multiple categories / subcategories … or that might not be supported. @v3xx, what do you think? I’m thinking we could semi-automate this by making use of tags so topics can be searched by subject but specifically inside the Tutorials & Guides category.